Permanent makeup goes by many names, permanent cosmetics, micro pigmentation, cosmetic tattooing and microblading. Whatever term you prefer, it is the enhancement of the face and skin with specially formulated pigments designed for use on the face, that are implanted into the first layer of the skin. About Face and Body follows the strictest hygiene and sterilization procedures. All equipment is sterile, including the use of disposable needles. Only the highest quality equipment and pigments are used. Strict OSHA and CDC guidelines are followed. We hope this information helps you make a decision about which service to schedule with About Face And Body. We are strongly committed to providing services that are a natural enhancement to your already beautiful face. Are there any contraindications for having permanent makeup or microblading? Candidates who may be contraindicated include people with diabetes, pregnant and lactating women, people with glaucoma, people who are taking blood-thinning medicines (e.g. aspirin), Cortisone, Steroids, Acutaine, Retin-A, Renova. You must have written permission from your physician if you are taking Coumadin or Heparin. People with skin diseases such as psoriasis, eczema, undiagnosed rashes and blisters and those with easily trigged post inflammatory hyper pigmentation are not good candidates. Also contraindicated are individuals who are attempting to cover or camouflage Telangiectasia or birthmarks. Additionally, herpes simplex was once considered a contraindication, however, with the advent of medications to control the viral breakout, herpes is no longer considered a contraindication. 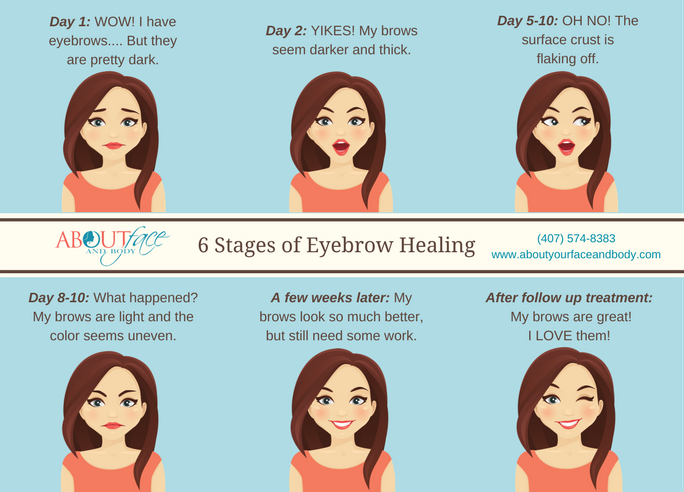 Can I have microblading or permanent makeup performed while undergoing chemotherapy treatments? We recommend having these services performed before undergoing chemotherapy treatments. Chemotherapy compromises your immune system, and as such, we are concerned about doing a service that carries a risk of infection while your immune system is compromised. We only make exceptions to this rule with written consent from you Doctor. I have seen a range of prices for permanent makeup. Why is that, and why should I choose you? Permanent Makeup is an art. As permanent makeup artists’, we have had years of training and experience refining our artistic skills, and continue to attend advanced training to stay current with the latest advancements in permanent makeup. We believe our work speaks for itself and while price can be an important part of your decision process, it certainly shouldn’t be the deciding factor. The length of time someone has been performing permanent makeup is not alone an indicator of the quality of his or her work. You may consider saving for a while to go to the artist that has demonstrated their skills with good before and after photos. Having the work done well the first time is much less expensive than having the work done poorly and then having correction work performed. Correction work can take months and involve multiple appointments resulting in fees adding up to $1,000 or more, depending on the number of appointments needed. We are confident in our prices and our work. How many appointments will I need? The color application process typically requires two appointments. The first appointment will lay the foundation and framework for the shape and color. During that appointment, we will likely encounter swelling, fluids and other challenges related to working with skin. During the healing process, the color on the surface of the skin will exfoliate and the color implanted in the dermal layer will surface. Over 4-6 weeks, the color will continue to evolve slightly. A second appointment should occur between your 1-month mark (1 month for eyeliner and 6 weeks for brows) and 12 weeks. We feel 12 weeks is plenty of time to schedule your touch-up. Light spots and a lighter layer of color will be completely normal and the second appointment will typically complete the process and intensify the color. Minor changes may be made at this time. Because we are dealing with skin and healing in a variety of conditions, we cannot guarantee that two appointments will be all that is needed to complete the process. However, a third appointment is rarely necessary and when it is, it is likely for the personal preference of the client and not because it is required for color retention. Touch-up appointment fees are less than the first appointment fees. If you have had permanent makeup done in the past, there are no guarantees of the retention of pigment, it may fade sooner and the color may not take at all. The number of appointments necessary will be determined by the healed results. What if I want to change my makeup? Change it! You can put any color makeup over it. Cosmetics may be applied over your permanent makeup for color variety. Some clients choose to apply a layer of conventional makeup to achieve a more dramatic effect for nighttime events. The choice is yours! I am really interested, but also really scared. Please come in for a consultation. While there is a $50 fee for this 45-minute appointment, this requires no commitment and may help you to make a decision that you feel 100% confident about. Please do your research, and look through our online portfolio while making your decision. What does a typical Permanent Makeup Consultation involve? In a consultation appointment, we discuss the procedures you would like performed. You can ask any questions regarding each procedure. With brows, we “draw” your custom desired design on your skin with a makeup pencil so you can see the proposed shape. We then select complimentary colors according to your skin tone. Unless you need a consultation to make your decision, we suggest you schedule your 2-hour service appointment and do both the consultation and application at the same time. How is Permanent Makeup performed? Permanent makeup is applied with natural iron oxide colored pigments designed for use on the face, which are implanted into the very dermal layers of the skin with a tattoo like “machine” or “pen”. Prior to implanting the pigment, the technician puts on a pair of sterilized gloves and inspects your skin to make sure you have no cuts, scrapes or other types of broken skin. The area is treated with an antiseptic solution and the technician then “draws” your desired look onto your skin (only the brows are drawn on before the procedure.) You are asked to verify the placement, position, and design, which is about to be implanted. Cosmetic tattooing can be completed in 1 ½ – 2 hours per procedure. Is it painful? This varies from person to person. A topical anesthetic is applied prior to and during each procedure to numb the epidermis. Each person might have an area that is more sensitive than another, although we try to keep you comfortable and relaxed. Clients usually have an idea how well they numb based on their experience at the dentist. Some people are so relaxed they fall asleep. Occasionally clients ask if they can take over the counter or prescription pain medications before or after their procedure. Any employee of About Face Ink should not be considered a medical professional and as such, they cannot prescribe pre or post medications for pain, swelling or any other reason. Any written or verbal conversation with an employee about over the counter or prescribed medications is considered a suggestion only, based on their experience with other clients or suggestions from other artist in the business of permanent cosmetics. Any over the counter or prescribed medications you choose to take pre or post procedure is your decision alone and About Face Ink, LLC or any About Face Ink employee is not responsible. Please identify any and all medications you currently take in your medical paperwork so we have an updated list in your medical history. When can I return to work? Although most people feel they can return to work or other daily activities immediately; there may be some redness, slight swelling and the area treated may have a thin crust for 7-15 days. The healing process varies from person to person and depends on the procedure performed. Can I wear makeup after the procedure? Keeping the area free from bacteria is vital to preventing an infection. Cosmetics should not be used on or around the treated area until it is closed and fully healed, which is roughly 5-15 days depending on your service and your typical healing pattern. When will I be able to see the results? Results are seen immediately although the full end result is seen in approximately four weeks. The color will soften and the light crusting will be almost gone in 7-15 days. Most procedures require a follow-up appointment. Follow-up appointments are scheduled 4-6 weeks later. Additional charges will apply for follow-up appointments. What will it look like immediately after? The color will be darker for the first 7-15 days. That is because color is both implanted in the dermal layer of the skin and it also sits on top of the skin (that is the slight crusting) and will get a softer look over 2 to 6 weeks. What If I have a suntan/sunburn? Please consider 30 days clear of sun exposure on either side of your appointment. Tanned skin is damaged skin, and your color will not heal properly. I attend the gym regularly or I am in body competitions/training for an upcoming event, or I am an avid swimmer. If any of the above applies to you, YOU are a perfect person for our services; HOWEVER you really need to think about the investment that you are about to make. 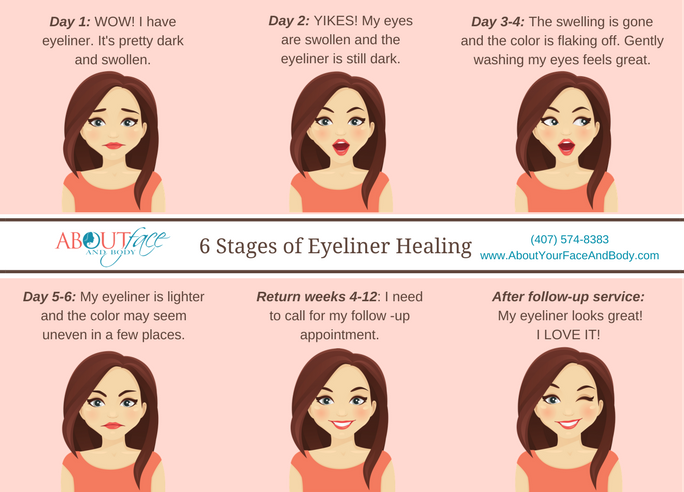 Eyeliner generally heals BEAUTIFULLY with ONE week of proper care and powder filled brows and hair stroke brow technique requires ONE – TWO WEEKS OF CARE. Any perspiration or over exertion will compromise this work of art we have just placed in your skin. SALT is used to REMOVE pigment, and hundreds of talented, educated technicians have all been documenting results that have shown a DRAMATIC improvement in retaining pigment if you can make this commitment to the healing time. Please don’t book if you can’t make this commitment. Remember, it is just as important to us that your permanent makeup heals beautifully. Hormones Most of us can do very little to change this; we just go with the flow! Sun Exposure Eyeliner: We suggest you wear sunglasses as often as possible. We also suggest you keep the area free from a build up of skin cells by gently cleansing the eyelids daily. Eyebrows: We suggest using an excellent sunscreen. We personally use and recommend IMAGE Prevention Moisturizer with SPF 50 (for $30.00). For your convenience, we have this product available for purchase at your appointment. Daily use of IMAGE Prevention on your eyebrows will protect them from some of the sun exposure. It is a high quality sunscreen that will not fade your permanent makeup eyebrows. Lips: Using lip products with sunscreen and moisturizers is both soothing to the lips and will protect the permanent lip color. Anti-Aging/Skin Care products Careful application of anti-aging products to your face is vital. From our own experience, a basic anti-aging moisturizer, when applied daily to the area ABOVE the eyebrows, caused the brows to fade more rapidly than expected. Skin care products can travel up to 3 inches from the initial application area! This means any product applied to the typical forehead may travel into the brow area. If your brows are fading in less than a year, this is most likely the reason. Medications Some medications may affect your healing time or color retention. It would be impossible to have a list of how all medications affect your outcome. Generally, it is not an issue but occasionally, it may be. We ask for your list of medications when you complete our paperwork in case we need it as a reference. Please include ALL of your medications and even your herbs and vitamins on your paperwork. Some medications are more likely to have an affect than others. For example, we know that blood pressure medication and some thyroid medications can cause the color to heal cool. Medications often prescribed for troubled skin are a red flag that you should wait for your service. Those on ACCUTANE must wait a full calendar year prior to obtaining permanent cosmetic services. We do what we can to predict these changes but due to the living, breathing, nature of the skin, we may need either additional appointments to get the color right or it may never be perfect. We do not give up easily and we are very patient, but this is one of the reasons we cannot provide a satisfaction guarantee on any permanent makeup. What do I do when my permanent makeup begins to fade? When you look in the mirror and wonder if you should add color with a pencil, you may consider coming in for a COLOR BOOST to your permanent makeup. About Face Ink advises that you refrain from color boosting services for as long as possible, using traditional cosmetics to enhance your fading pigment. This will ensure a truly “fresh” boost when the time comes and protects the integrity of the skin. We suggest you wait at least 1 year from your follow up appointment, although you may not feel the need to come back much longer than that. Due to the fabulous pigment line that About Face Ink uses for all of its services, you are not committed in any way to continuous maintenance, your pigment will simply fade away slowly over time, however, because we are absolutely certain that you will LOVE your results, we are sure you will be back! EYELINER Color boost are typically requested every 1 – 4 years. POWDER FILL BROW Color boosts are typically requested every 1 – 4 years. HAIR STROKE BROW/MICROBLADING This procedure is VERY delicate, and aftercare is the key to a great-healed result. Proper aftercare and the right skin type and color should result in a service that last 12 months to 2 years. I noticed the top and bottom lines do not connect in the corners of the eyes. Is there a reason for that? We cannot connect the eyeliner in the corners because you may experience something called migration. The tissue in the corner of the eye is very thin and the pigment may travel in the skin creating a cloudy or smudgy appearance, leaving a very undesirable look to the eyeliner. You may see examples online of work from permanent makeup artist where the corners ARE connected, but the migration can still occur anytime. We decline this request because we will not take any chances. Will the lower liner come all the way across the bottom to the inner corner? We offer several options for the length of the lower liner. We will never go past your tear duct due to issues of migration and damage to the tear duct. We can taper the line towards the tear duct or stop just past the pupil. This decision is made at the start of your appointment in the consultation stage. Will you apply color to the line above the lower lashes, otherwise known as the wet line? Similar to the migration of the corners, the wet line is very moist and even if the color applies beautifully initially, it does not age well. It eventually smudges and looks like a disorganized blur of color, usually turning blue. This can also affect your ability to create eye moisture over time. There is ABSOLUTELY NO WAY TO REMOVE IT, EVER! Will you add a wing to the corner of the top liner? We can, but will do so only after consulting with you on the long-term implications. First and foremost is that over time, it does not age well. Eyes change dramatically as we get older. While the “wing” may be lifted out or up when we apply it, it will eventually droop down and appear miss-placed or miss-shaped. Due to the fact that some color may always stay in your skin, the eyeliner may not be easily color-boosted years later if the wing needs reshaping. We usually recommend a more natural eyeliner that compliments the shape of your eye. We can often provide a subtle lift to the outer corners. Will the eyeliner look like wet liner or stay very dark? Permanent makeup will never have the deep dark look of liquid liner. As we apply the liner under the dermis of your skin, the skin diffuses the color. It’s similar to placing pantyhose over the top of a black sock. The black sock is no longer as dark as it was without the pantyhose over the top. Immediately following the procedure the color looks darker and bolder because the color is sitting on the surface of the skin. After the surface exfoliates over the next 7-10 days, the color is more muted. You may, however, apply cosmetics anytime you want the color to be bolder. The color of your own skin will have a lot to do with the final outcome of your permanent eyeliner color. If you have dark skin, the color will not show a sharp contrast, as it will with someone with pale skin. On dark skin, permanent eyeliner will appear more of a soft grey to a soft brown. For you, permanent cosmetics may be your “get out of the shower or pool and look like you have makeup on” look. As stated above, you can always use washable cosmetics over the top to create a dramatic effect for dressing up. Can I have a very thin line? Yes, we call that a mini-liner. It’s a thin line just inside your lashes. This can make your lashes look thicker and provide definition to your eyes. Do you have different colors for me to choose from? Starting in your lashes and building up, we often layer a beautiful brown-black and a dark black for a nice, natural look. At your follow-up appointment, we determine if reapplying the same combination is desirable or if we want to intensify the color with a little more black. Straight black wants to turn blue-grey so applying a base color creates a more satisfying result. Brown-black can also be used alone for an even softer effect. Fashion colors are available but require a brown-black base to provide depth of color. Are there different styles of eyeliner to choose from? We offer a slightly more defined style of eyeliner (more similar to a wet liner, although as discussed above, it will never have the deep dark look of wet liner), or a softer, more smoky or shaded style of liner. The differences are subtle and depend on the tools used to apply the color. Either style is easily altered at the follow up appointment. These options will be discussed at the start of your appointment during the consultation when color and shape are also determined. Do I have to discontinue using lash growth products prior to an eyeliner procedure? YES! If you are currently using ANY lash growth product such as Latisse, GrandLASH, RevitaLash etc. you must discontinue using these products for two weeks to one month prior to an eyeliner procedure. What Type of Permanent Cosmetic Service is Best for MY Eyebrows? POWDER FILLED Powder fill techniques and pigments have come a LONG way and the results that we have with our clients is soft and powdery, often undetectable from traditional cosmetic pencils, except that they are perfectly applied 24 hours a day, 7 days a week. BOLD BLOCK BROW This method has been very popular around the world for decades. Often European clients (and others) will request a “BLOCK” brow. This is similar to the powder fill, although it uses concentrated pigments that are implanted in a very dense manner. We do offer this service VERY SELECTIVELY, as this is the most permanent of all of the brow techniques; therefore, it requires a very serious, very long-term commitment. HAIR STROKE This type of brow is taking the industry by storm. Once your shape has been drawn, each hair stroke is individually implanted with pigment to give the appearance of actual “hairs” in a beautiful pattern. The simulated hairs are not “mirror imaged” from one brow to another, they flow with your natural hairs that are growing in your brow area. This style brow works best on skin that tends to be dry (free from oil and hormonal perspiration) and is relatively smooth. Heavy lines and wrinkles, large pores and sun-damaged skin do not allow the delicate hair strokes to be placed in the skin. MICROBLADING This technique is receiving a lot of media attention. There are more lies than truths in most of the information available. (We know that is a bold statement but this a source of frustration for us on a regular basis.) We have included an article entitled Tattooing vs. Microblading here on our website to dispel some of the lies and myths that are prevalent today. The bottom line is that Microblading is done by a small hand tool rather than a machine. We use the same pigments regardless of the method and it is definitely permanent makeup. The skill of the artist and the skin of the client should determine the tool used to implant the color. If you desire a look that simulates hair, the artist will decide which tool is best to achieve your desired result. Not everyone is a candidate and it does not create as pleasing of a result when covering previous permanent makeup. Your artist will strive to create the look you desire and tell you what she believes is realistic for you and your expectations. Is one type of brow service better for me? YES. Most clients have certain factors that GREATLY influence the success of permanent cosmetics for their brows. Answering a few simple questions really helps in deciding which technique is right for you. Is your skin oily, have large pores, wrinkled or have sun damaged? If the answer is YES, The POWDER FILL technique will be BEAUTIFUL for you for many years. You are NOT a candidate for the hair stroke technique. Your skin type will simply not allow the hair strokes to heal beautifully within the skin. They tend to blur and often look powdery anyway. We want you to have a realistic expectation of the end result and we will be honest with you regarding the style brow we believe you will be most happy with. Are you fair skinned or afraid of color? If the answer is YES – you are probably one of the gorgeous faces looking for a ‘lift’ to your appearance because your natural brows do not give the frame to your face that most clients are looking for. If this describes your skin or your fears, then the POWDER FILLED BROW, when done properly, can produce a very soft, very natural, “barely there” brow that will give your face a proper frame. You may not be a candidate for the hair stroke technique. The very light pigment may simply not be visible when we attempt to place these strokes within your skin. Do you have existing hairs that are very light or white? If the answer were YES, then you would need to think about maintenance. White hairs are more visible on the surface no matter which technique is used. A very SOFT POWDER FILLED BROW, behind the light hairs, is BEAUTIFUL. If you are certain that you want a medium to dark color brow, then you need to realize that maintenance of your natural hairs will be required. Regular tinting of your natural hairs is one option, or shaving or waxing is another. It is important to realize that white or very light brows create a beautiful dimension to a soft powdery brow without locking you into ongoing weekly maintenance. Alternatively, creating a slightly bolder frame to your face can appear to take years off a maturing face and create an illusion of an eyelift. This is really a personal decision that only you can make. Remember, if we start light, we can always add some additional color. We recommend trying the soft powdery brow first, we can add some depth at your follow-up appointment or a future color boost if you decide. Do you love the look of the hair stroke technique, but also hope for a result that will last for years with little maintenance? If you answered YES, the POWDERED FILL BROW typically requires the least amount of maintenance. Results may last for many years The BLOCK BROW (see above) will have a VERY long result, but is discouraged in most situations. Because the HAIR STROKE procedure is VERY delicate, your aftercare can be vital to a great-healed result. Considering the many variables in color retention, results may last 12 months to 2 years. Hair strokes typically fade into a powder styled brow over time as the fine stroke becomes less distinct. The strokes can typically be replicated at your color boost appointment. Can you make my brows match each other perfectly? In our industry, we have a saying, “Brows are sisters, not twins.” Our faces are not symmetrical. If they were, we would actually look very different than we do now. Our goal is to make them look similar enough to complement your face and enhance your beauty. A perfect match is impossible and quite frankly, not our goal. You should have a realistic expectation of this to be happy with your procedure. What if I currently have Botox injections or plan to have them? Do you plan on maintaining Botox throughout your lifetime? If not, consider your brow service first. If you plan on maintaining the Botox, we can do the procedure after as long as the Botox has had time to settle. We recommend a minimum of 2 weeks. If at some point you don’t maintain the Botox there is a risk your brows may appear slightly uneven. My lips are no longer evenly shaped and I was interested in permanent lip liner to reshape them. Is this possible? Lips are the most challenging service we offer. Not everyone is an ideal candidate. We require at least a photo by email or possibly a consultation to determine if this service is appropriate for you. What if I currently have lip fillers or plan to have them? Do you plan on maintaining fillers throughout your lifetime? If not, consider your lip service first. If you plan on maintaining fillers, we can do the procedure after as long as they have had time to settle. We recommend a minimum of 2 weeks. If at some point you don’t maintain the injections there is a risk your lip line will appear slightly uneven. This should be discussed at the lip consultation. Didn’t find what you were looking for? Submit a question below, and we will be in touch with an answer!